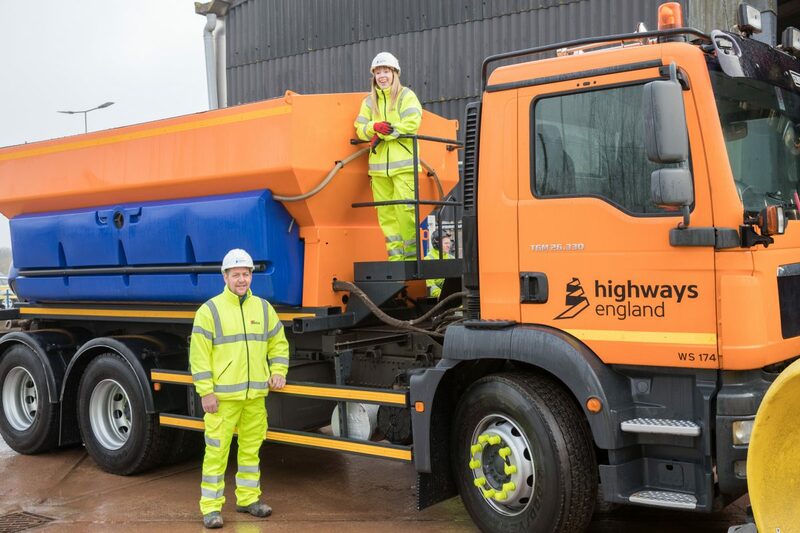 This husband and wife show true grit and determination to keep our motorways safe – by working as Britain’s only married road gritting team. 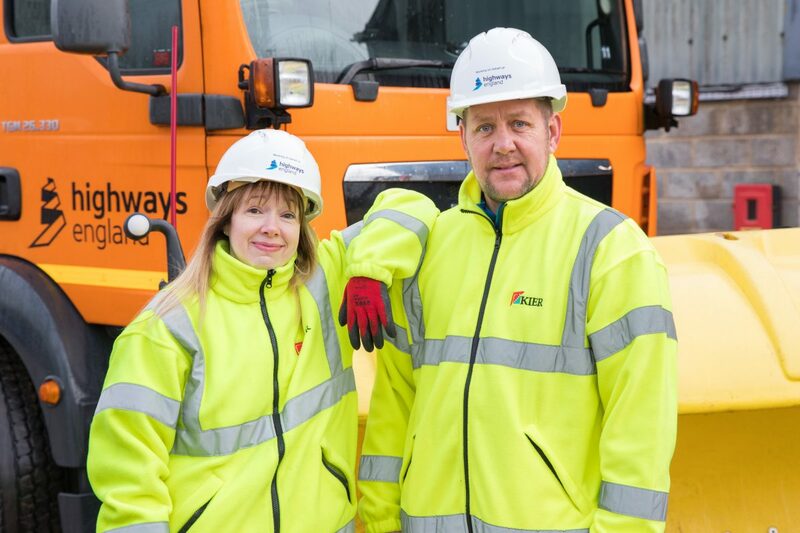 Karen Smith-Storer, 39, and her husband Neil, 48, have been working together at Highways England to keep major routes moving clearly during the winter months. The pair take to A-roads and motorways around the Midlands and Worcestershire no matter what the weather spreading salt in their 20 tonne vehicles. Karen admits she turns heads on the motorways when male drivers spot her behind the wheel of her truck – but insists she is the better driver of the pair. Karen, who has been working for Highways England for the last 11 years, said: “We do have a laugh about it when we are together at home, albeit my husband knows I am the better driver out of the two of us,. “We’re lucky in the sense that working and living together hasn’t impacted on our relationship. “There have even been times when we have crewed up together and it’s quite nice to work with Neil as we have that familiarity and understanding of the other persons traits. “I think it really helps with pressurised situations at work because we have that support and understanding for one another. “It’s quite funny and it always makes me smile because I have seen several male drivers look at me and they are clearly surprised to see this petite woman driving such a large piece of equipment. “I really love my job and I really enjoy the solitude of driving the truck and being in my own office, of sorts. The couple, who live in Worcestershire, have been together for 12 years and married for three. They both operate from the Strensham depot next to the M5. They work on vital routes including the M5, M50, A49 and the M42 in a bid to keep transport networks flowing as much as possible. Neil added: “We do have some banter between us but it’s nice because we can learn from each other and that’s how we look at it. Despite the light-hearted banter between them, the pair say they take their job seriously after 36 gritters were involved in crashes in the last 12 months. The couple advise motorists leave plenty of distance between themselves and the gritter in front of them. Each spreading machine is limited to 40mph and must travel in the middle lane to ensure the salt is spread evenly and safely across the whole of the carriageway. Neil added: “I often see cars trying to undertake me and driving in the hard shoulder where there could be a stranded vehicle in snow or a breakdown. Highways England’s national winter and severe weather team leader, Paul Furlong, added:“Although the vast majority of people support our gritter drivers by leaving a sensible distance and only passing when it’s safe to do so, we do have occasions when people misjudge the situation and end up colliding with one of our vehicles. “We have also noticed a growing problem with driver using the hard shoulder to undertake gritters, risking a collision with stationary vehicles on the hard shoulder and causing a hazard to gritter drivers who need to exit at motorway junctions.